The origins of Marine Projects can be traced back to a day early in 1963 when three men set about starting up a boat chartering business. Cliff Viney a former merchant navy engineer working as a marine engine tuner. David King a serving officer in the Royal Navy and Brian Phillips also a serving officer in the Royal Navy; decided to purchase a Senior 31 hull and deck moulding to fit out in their rented shed in Newport Street, Plymouth. The 31 foot hull and superstructure arrived within a few days and the men decided to form a limited company. 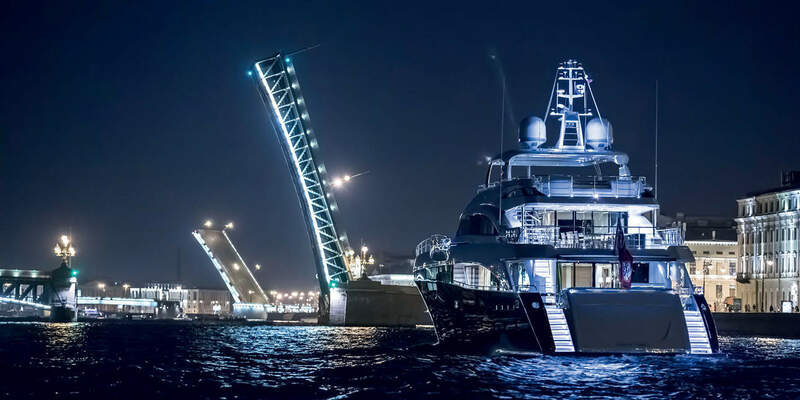 The original name Marine Enterprises had already been registered, so they thought up another name and that was how Marine Projects came into being. At first they made slow progress until King and Phillips left the Navy and joined Viney full time. They found it difficult to get deposits on firm bookings and decided to sell the boat instead. To their surprise this was easily achieved and the ‘Project 31’ sold for £3,400.00. After selling the boat they realized that there was a potential market for offshore cruisers using the ready made Senior 31 hull. And between 1966 and 1969 more than 150 of them were produced. The success of Project 31 led to premises expansion and the companies first venture into GRP (Glass Reinforced Plastic) moulding, after the hull supply company had difficulties meeting the rising demands. Once Marine Projects were granted rights to mould under license they decided to concentrate more on the new 32 foot model – the first in the princess range, also the first moulded in-house. The Princess 32’s debut at the 1970 boat show was also successful due to its better standard of finish and equipment than its preceding boats (Project 31 and Pilgrim 30). The Princess 32 also became the Marine Projects boat priced to sell via the trade. Home and overseas agents were appointed and a network of Princess dealers established. The production of the Princess 32 continued for ten years and with more than 1200 sold, it was the most successful model in the companies history. 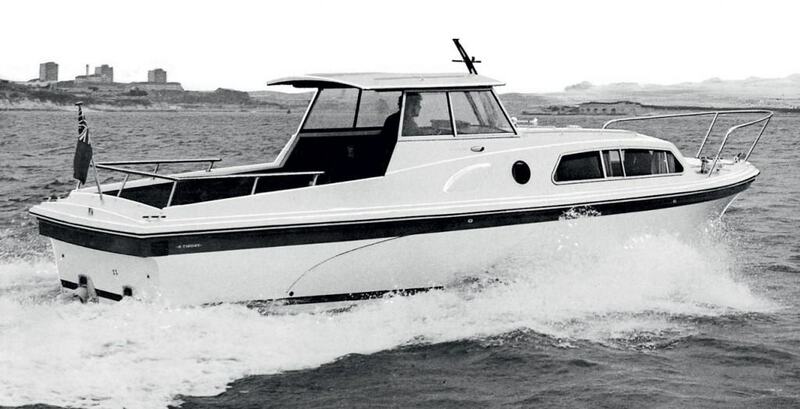 In 1973 the company turned to designer John Bennett to design two new boats to complement the 32. The first of these was the 18 knot Princess 37, introduced at the 1974 London boat show. The second boat was the Princess 25, also launched in 1974, despite design changes it remained reminiscent of the Princess 32 and was capable of over 30 knots. In 1973 and 1974 political and economic uncertainties threatened sales, but thanks mainly to their overseas dealers, Marine Projects were able to ride out the storm. But when the Yom Kippur war threatened world fuel supplies, they decided to venture into less fuel dependant products – sailing yachts. A.H. Moody and Sons were renowned for their bespoke yachts, and a deal was agreed with Marine Projects, who have since, continued to produce all of Moody’s centre and aft cockpit designs. The years 1975 to 1981 (the first flybridge years) saw a range of variations on the Princess 37 theme. The larger range now being produced and an expanding market required a need for larger premises. Newport Street was already fully utilized and the Plympton side was in use for sailboat production. New premises were found at Lee Mill and the new complex was opened as a moulding shop for all models. By 1980 David King noticed the trend towards bigger and faster craft. Designer Bernard Olesinski was invited to design a threshold Princess. The Princess 30DS was the first in a new generation of designs, which were to typify Princess styling in the 1980’s. The 30DS sold over 500 between 1981 and 1989. 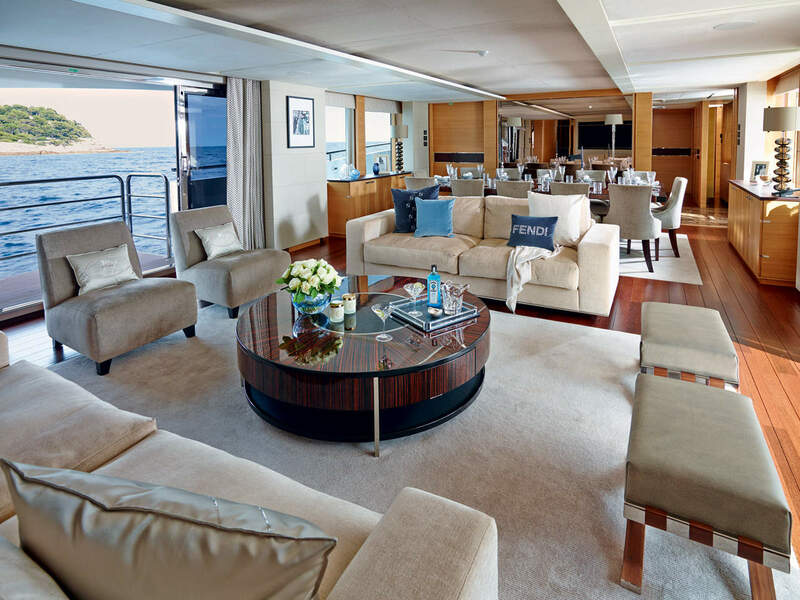 Olesinski’s next design, the Princess 45, was even more advanced and it also met the demands of those who were seeking up to eight berths and over 30 knots. Launched in 1981 it satisfied the export markets and was effective in helping to overcome the recession of the early 1980’s, whilst also finding new markets world-wide. The 45 sold over 400 in nine years and was then replaced by the princess 455. In 1983 Olesinski designed a sports boat (the 286 Riviera) to satisfy Mediterranean dealers demands. This broke away completely from the traditional Princess design and the 286 almost sold as many as the 30DS. But more importantly it established the Riviera series of high speed sports cruisers. 1990 saw the launch of Olesinski’s Princess 65, aimed principally at the Mediterranean market. 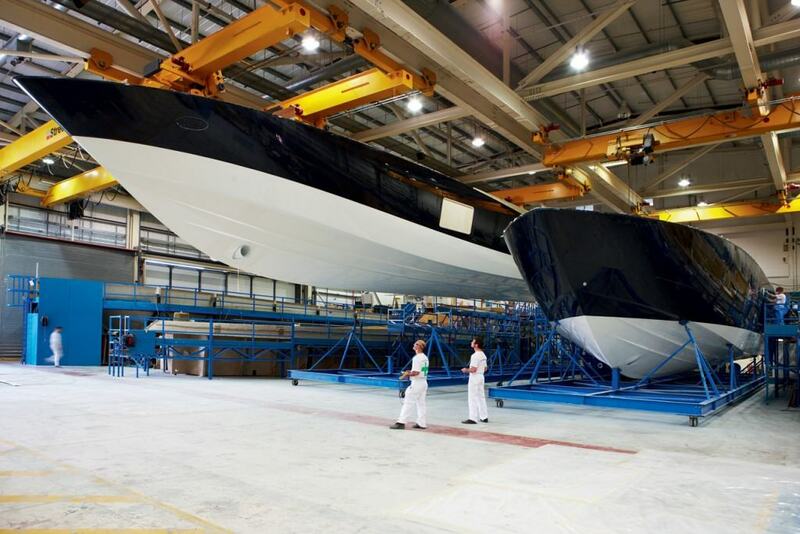 Marine Projects could claim once again that their flagship was Britain’s largest production boat. It was a gamble that paid off in the face of a threatened worldwide recession. As in the earlier years, the 1990’s saw Marine Projects expanding even more with many new boats being introduced into the ranges of motorboats and yachts, including the largest boat yet to be built at Marine Projects the 25 Metre. On 1st August 2001, Marine Projects became Princess Yachts International plc. Princess Yachts International’s Head Office is based on Newport Street, Plymouth, alongside waterfront factory; in addition they have four other production units in the Plymouth area, totaling around 1,000,000 sq ft (94,000 sq m). Today they manufacture a range of 20 models ranging from 42-130ft and are recognized amongst the world leaders in the boat building industry. The work of craftsmen in Plymouth boatyards has spread the Princess reputation across Europe to the Middle East, from the Pacific Rim to the Americas. At the heart of this success lies a total commitment to quality. Traditional skills meet with computer-aided design and precision manufacturing to create a beautifully crafted product at the highest level of efficiency. Additionally, Princess family ties to LVMH where the highest levels of quality and unparalleled luxury always come as standard. The strength and heritage of LVMH ownership ensures that Princess style never stands still and enables collaboration with some of the most illustrious fashion houses, enjoying a close relationship with Fendi Casa. The recently introduced range of M Class super yachts continues to grow, with two exciting new models due to be launched in 2015 to add to the award winning flagship of the range, the Princess 40M.